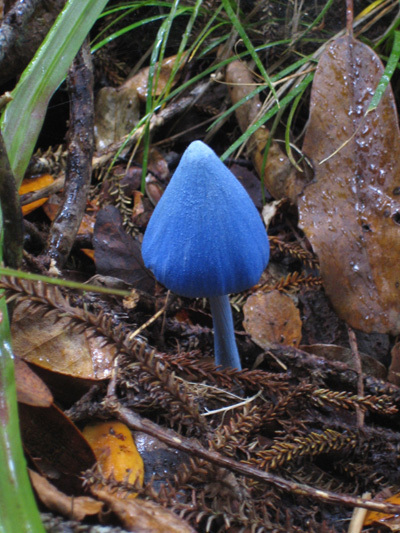 Whilst walking on Great Barrier Island, NZ we came across this stunning fungi – Entoloma hochstetteri. An impressive blue colour combined with a delicate structure made it appear almost ‘artificial’ rather than a creation of nature! This entry was posted in Learning thoughts on March 4, 2007 by Stephen Powell. Wow – it’s stunning. Something about it looks poisonous 🙂 Imagine putting in a stir-fry with red peppers, orange carrots and bright green broccoli – mmmmmmmmmm! Now why don’t we have those in the UK ! Is that for real ? Yes, growing naturally in the wild!